William R. Corliss (August 28, 1926 – July 8, 2011) was a cataloger of scientific anomalies (observations and facts that challenge prevailing scientific paradigms) and he published many works on the subject. He wrote 13 books for the National Aeronautics and Space Administration (NASA), a dozen educational booklets for the Atomic Energy Commission (AEC), and a dozen articles for the National Science Foundation (NSF). According to the Baltimore Sun, "As a physicist, he was Director of Advanced Programs in the Nuclear Division at Martins in the 1960's. Later, he became a prolific writer, authoring 57 books on atomic energy, space propulsion, scientific satellites, teleoperators, wind tunnels, and scientific anomalies in all fields of science." Corliss obtained degrees in physics from Rensselaer Polytechnic Institute (B.S., 1950) and the University of Colorado (M.S., 1953). Corliss was also a member of the American Association for the Advancement of Science and the Society for Scientific Exploration. He lives in Glen Arm, Maryland, USA, where the Sourcebook Project is located. Since 1976, Corliss has published Science Frontiers, a bimonthly newsletter providing digests of reports that cite and describe scientific anomalies. Concerning the evolutionary and old earth creationism paradigms which theorize the earth is billions of years old, Corliss's work on geological anomalies catalogs scores of anomalies which challenge the old-earth paradigm. 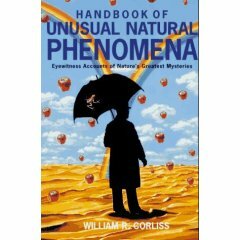 The science magazine New Scientist had an article which focused on the career of William Corliss. New Scientist wrote regarding Corliss's work: "All I can say to Corliss is carry on cataloging". Arthur C. Clarke described Corliss as "Fort's latter-day - and much more scientific - successor." Corliss, William R., Unknown Earth (Glen Arm, Maryland: The Sourcebook Project, 1980), p. 219. Corliss, William R., A Search for Anomalies, Journal of Scientific Exploration, Vol. 16, No. 3, pp. 439–453, 2002. Hope, Adrian, Finding a Home for Stray Fact, New Scientist, July 14, 1977, p. 83 (focusses on Corliss' career). This page was last modified on 3 April 2019, at 18:16.